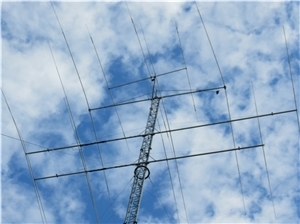 Like most hams I have dreamed of having a rotating tower to be able to put up yagi antennas even for 30, 40m and maybe a stack for 20m. 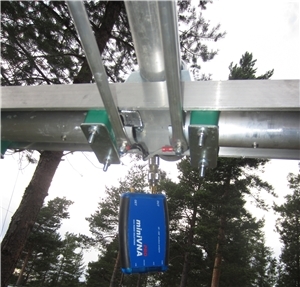 In the spring of 2012 i got the oportunity to buy a complete tower with some antennas to a price of a better rotator. 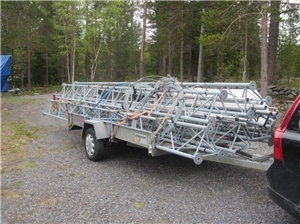 The 36m (120 ft) tower was built by the famous OH8QD 9 years ago and was in perfect condition. Included was also antennas of various types. I kept the 15,20,and 40m antennas and sold the others. The tower was bougt as it was so I had to take it down, the first guy to call when you need help with this kind of job is SM2NOG H-G. He did all the climbing. We took down the antennas manually. After removing the antennas we hired a mobile crane to take down the tower it self. Everything was placed on the back of my car, and secured to manage the 650 km drive. After bringing the tower antennas to my summer house at Seskaroe Island it took a while before I decide to put it up again. I started with refurbishing the antennas, both those I took down with the tower but also antennas that I had from before. I decided to put up the 2 el for 40m, build a new 2 el for 30m, Buy a another (of the same type) 5 el 20m yagi to make 20m stack, put up the 5 el 15m, rebuilt another 4el 20m yagi to a 4 el 17m, rebuilt a 4 el 15m yagi to 4 el 12m and put together two 10m yagis to one 6 el. 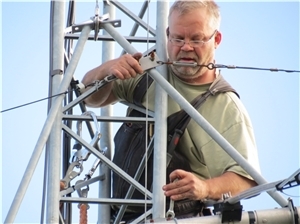 All antennas was redesigned and optimized by SJ2W Mike. I will describe each antennas project on separate pages. The area around the summer house is covered by rocks so it’s very easy to just drill holes in a big piece of rock and attach bolts in them. And then fasten the base of the tower with the bolts. For the other towers I have used natural placed rocks both for the towers and for the guy wires. For this tower I had to dig for two guy anchors, for the third a natural rock is used. 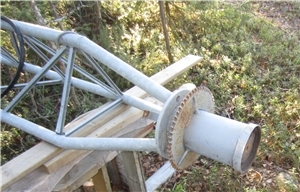 On the picture the rotator is bolted to the base of the tower. 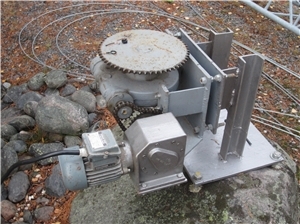 The rotator is built by OH8QD and are based on a 3-phase 400V motor and two gear boxes and two chains. the tower itself will stand on a ball bearing. 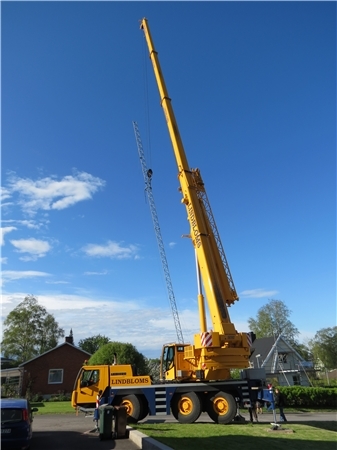 My goal was to hire a mobile crane before the winter and get the tower raised. The tower was assembled, guy wires where attached and all was settled, even 1/2″ feedlines for the top antennas where in place and I assembled the 30 and 40m yagis to be able to put them up also. But unfortunally the crane was busy all weekends until the snow came, so the tower has to spent the winter under the snow in horizontal position.